This is a sponsored post written by me on behalf of Pompeian Olive Oil. Guess who has been grilling often now that it's summertime? It's quick and the food is always so much tastier. Plus, it's a great time to get together with family and friends for some good food and conversation. It's National Grilling Month and we are going to celebrate with some Pompeian Grapeseed Oil and OlivExtra Premium Mediterranean Blend. Hubs usually grills steaks, chicken, shrimp, sausage and ribs with an assortment of veggies on the side. The marinades and rubs are pretty standard and simple yet the flavor is rich from the grill. He usually grills at least once a week for dinner and then on the weekends we grill at his parents at least twice a month. They sure do love to grill because we can sit outdoors and the kiddos can play in the backyard our Yorkie Lucky - who loves the scraps of food and begs for more. We just went to our friends home the other week and they grilled up some delicious ribs and steak. We also had a grill fest during our 4th of July celebration with burgers, tri tip, steak and other meats. It was even nicer when after a lazy and slow afternoon of eating and conversing, to jump into the pool for splash time. Did you know that you can make grilling healthier by using Pompeian Grapeseed Oil or OlivExtra Premium Mediterranean blend? I didn't until now. My knowledge of olive oil was limited and I just knew to look for extra virgin. 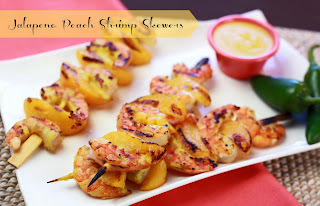 There are so many delicious recipes to grill this summer and Hungry Girl's Jalapeno Peach Shrimp Skewer looks scrumptious! I have been on a jalapeno kick lately and Kenzie loves shrimp as well as expanding her palate to include spicy foods so this recipe is perfect for our family. The minimal ingredients required as well as the quick cook time gets a thumbs up for me. 2. To make the sauce, place 1/2 cup drained peach slices in a small food processor or blender. Add all ingredients except shrimp and remaining peach slices. Puree until smooth. Transfer half of the sauce to a small bowl, and refrigerate until ready to serve (for dipping). 3. Bring grill to medium-high heat. 4. Evenly thread shrimp and remaining peach slices onto 4 skewers. Brush both sides with some of the remaining sauce. Grill until shrimp are cooked through, 1 - 2 minutes per side, brushing with remaining sauce as they cook. 5. Serve with the refrigerated sauce for dipping! I am going to ask Hubs to pick up these ingredients so we can have fun grilling these shrimp skewers. Perfect for summertime backyard parties with the family and friends. What do you like to grill? Do you use olive oil for your recipes? Pompeian Olive Oil, a leader in olive oils and vinegars, is here to help you celebrate July for National Grilling Month! Pompeian products give you a taste of the Mediterranean without leaving your backyard. By using Pompeian Grapeseed Oil and OlivExtra Mediterranean Blend products you can make grilling healthier and more flavorful in a Mediterranean way. For more information about Pompeian Olive Oil, please visit http://pompeian.com/. And if you are looking for recipe inspiration, be sure you do not miss the below Hungry Girl recipes! This is actually the only type of oil we use and those look super yummy! My husband would love that shrimp recipe! Turned out great! Those look delicious! We love making ribs on the grill, but my husband LOVES shrimp! I think we're going to have to break out our grill! :) I love Pompeian EVOO, but I don't think I've used it for grilling before. I'll have to try it! Oh wow this looks and sounds so yummy! Oh especially the salad! Love the Pompeian oil! Thanks for sharing your recipe as well. Delicious! Going to have to try this--I just got a bunch of peaches that would be amazing in this recipe! I love olive oil, but my grilling with it has been restricted to pizza, so I think I should branch out. These look so delicious I wish I was enjoying these right now.